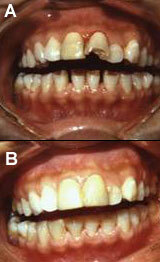 Previously fashionable gold fillings have given way to the "white look." There are a few reasons for this shift. The silver (amalgam) filling is unfashionable, as is gold, and carries the concern of mercury poisoning (the amalgam filling is a mix of silver, tin, and mercury). Plus, new composite and ceramic materials have been proven clinically successful. There are currently 4 broad groups of materials used for white fillings. Composites can be used on all teeth and on all surfaces. Composites are placed directly in the tooth and set very hard within seconds. A blue light usually activates the setting but self-setting composites exist. Composites have been in use for over 20 years and manufacturers constantly improve their strength, smoothness, and natural colour components. No post-operative pain and pleasing appearance are the benchmark for this material. The composite bonds to the tooth, so new techniques can be used to rebuild the ravages of tooth decay or trauma (see Figure 1). Less of the healthy tooth is removed and this often means there is less need to freeze the mouth. Unlike the original composites used in the '50s, the current composites are regarded by universities and dental boards as permanent, safe, colour-fast dental filling materials. Glass-ionomers - a product developed in England - is a mix of glass and acrylic (polyacrylic acid). In most respects, this material does not compare favourably to the composites. It is not as strong, does not always match colour, and is not as smooth. They have a superior bond to tooth structure in most conditions. They release fluoride, which prevents returning tooth decay. They almost universally do not require freezing to place the filling. Co-pomers are a recently introduced hybrid of composites and glass-ionomers. They are more similar in qualities to the glass-ionomers, while their colour and smoothness are superior. The dental technique, however, is challenging at present and the long-term results are not available. Ceramic or porcelain fillings are bathed in antiquity in the dental profession. Ceramic material is the most pleasing material to duplicate the natural tooth. Its strength is good, but it can be very brittle. Ceramics, unlike the composites, glass-ionomers or co-pomers, require 2 visits to the dentist - to make the filling, an "impression" is taken of the prepared tooth and sent to the dental laboratory for fabrication. On the second visit this crown, inlay, or onlay is placed on the tooth with a special sealant cement. This method is capable of the best naturalness of any tooth replacement material. The main reasons for its limited use are its tendency to break and its high cost (5 times more). Does your dentist practice these techniques? How long has he or she been performing this technique? Ask to see photos of his or her work. If your dentist does not practice the techniques you want, ask to be referred to someone who does. Ask friends, family, and coworkers if they have white fillings and would they recommend their dentist.